The president of Ireland visited the Choctaw Nation May 23rd to convey thanks for an act of generosity from the Choctaws to the Irish 148 years ago. Chief Roberts also gave President Robinson a silver medallion featuring the Great Seal of the Choctaw Nation, which she immediately placed over her head and wore for the remainder of the day. She told the crowd that Chief Roberts had given her a book and tapes to help with her Choctaw language lessons. She began her public address with an expression of sympathy from the people of Ireland to the people of Oklahoma on the bombing of Oklahoma City. “I realize that this made a very deep impact on the whole of Oklahoma. “My coming here today goes back to an event of almost 150 years ago. 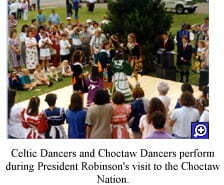 I am here to thank the Choctaw Nation for their extraordinary generosity and thoughtfulness when they learned in 1847 about the plight of poor Irish famine victims,” said President Robinson. “I know that both the Choctaw people and the Irish people remember the past. I know that you recently had a commemorative walk of the Trail of Tears to remember your own period of famine in Choctaw history. Members of the Choctaw Nation, including Chief Hollis Roberts, have come to Ireland and taken part in an annual Famine Walk in the west, starting in Louisburg, to commemorate the famine,” said Robinson. “Earlier in the month I met one of the members of the tribe, the artist Gary Whitedeer, who brought me a beautiful painting. He explained to me that taking part in that walk and remembering the past between the Choctaw Nation and Irish people and relinking our peoples is completing the circle. I have used that expression recently at a major conference on world hunger in New York. I spoke of the generosity of the Choctaw people and this idea of completing the circle. “I believe that we have in common that bond of humanity and it should be an additional reason why we should particularly reach out now to countries who suffer from poverty and hunger. I think it is very important that we should try to give leadership in that and that we try to encourage others to understand that there are people today who need the support that the Choctaw Nation gave 150 years ago to the Irish people. “It was a great pleasure to come and get a sense of the pride in your past, your identity, your language, your customs and in your culture. She said goodbye in Choctaw, Irish, and English, offering a warm welcome to any Choctaws traveling to Ireland. In spite of running slightly behind schedule, President Mary Robinson was greeted by about 500 people who had come to hear her address and waited patiently for her arrival. 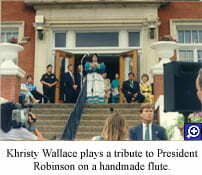 Chief Hollis Roberts greeted the President and her husband, Nicholas, on the front walk of the Tribal Complex. Chief Roberts, his daughter, Tina, and granddaughter, Sabre, along with a multitude of Secret Service representatives, escorted the President and her delegation into the building. After a brief visit with the Chief, President Robinson shook hands with all twelve members of the Tribal Council and tribal judges who were present for a welcome reception. Having heard of the President’s interest in the tribal WIC program, Chief Roberts escorted her across the breezeway to the Woman, Infants, and Children office for a review of the program and a peek at some of the children receiving services.